ROSEMARY HARRIS: Next week I'm having a few old friends over for a BBQ. Nothing fancy - Bruce will grill chicken, burgers, dogs, corn, we'll make a few salads and if the strawberries look good I'll make a strawberry/blueberry cream cake. No, the food is not an issue. And give my pals a cooler full of diet soda, beer, wine, vodka, sangria, prosecco, frozen margaritas, martinis and g&ts and they'll be fine. With the exception of two all the guests are friends from high school who I've reconnected with in the last three years or so. Is that why I'm doing everything but having the house repainted? I started slowly - moving things around the pool and the deck. I told myself it was just to make more space. 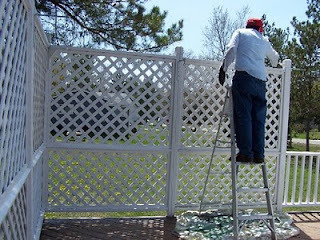 But what was the rational behind replacing the falling apart lattice and painting the new one? Scrambling to buy new pool floats (not eaasy to find at the end of July) because the ones we had were slightly dirty. Weeding the woods that border our property. Artfully rearranging - oh, just about everything I own? Husband says we should have parties twice a year if only for the major shake-up that it involves. Does anyone else do this? My friends are not going to grade me on my container garden, or whether or not the throw pillows work with the throw on the wicker loveseat that's soon to be moved to the pool. Particularly after the first drink. Have a lovely party, Rosemary. They're going to have a fabulous time. 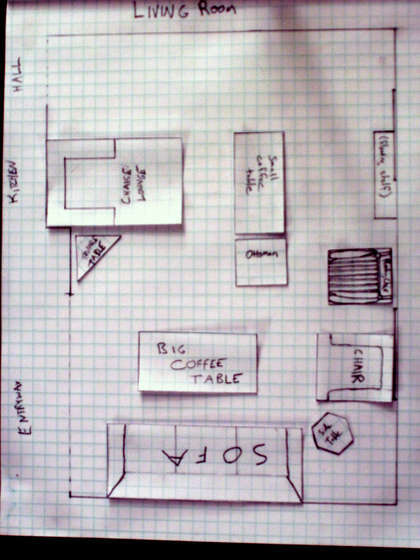 oh my gosh, I remember designing my living room using graph paper and paper furniture. Personality detail..that was very diplomatic! The graph paper wasn't really mine, but like Dru I remember cutting up pieces of paper and moving them around on graph paper. RO? Yes. xoxo Have fun. I have old college friends coming to stay in September and I've been making a list of things that need sprucing up--carpets cleaned, new pillows in guest room etc. We just had the downstairs bath re-glazed. And I did suggest to John that the house paint could do with a touch up. It's funny how insecure we become about our homes reflecting ourselves, isn't it? My husband says we should NEVER have parties or out-of-town guests for that exact same reason . . .
And I would weed my flowerbeds if it didn't mean croaking from heat exhaustion, but the woods? Ro, that might by a teensy, teensy bit, um . . .
You say that like it's a bad thing ... . When I had my first apartment, I invited my parents whenever chaos prevailed. Instant order, for me, but my mother noticed blinds vacuumed but not washed etc. I was thrilled to learn that being too clean engenders allergies. No one in my house is so threatened. Throwing parties, inviting friends for dinner, afternoon tea--they're my primary motivation for housecleaning. Well, not exactly. The entertaining and cleaning are all ways to avoid writing a synopsis or troublesome scene. I throw parties because it's the only time my family will help me clean, and the only time they tolerate my insanity to re-arrange, repaint, repair, and redo pretty much everything! I did a lot of nodding as I read this post. I should note: we only have two parties a year! Guess, we just all have this tendency to be anxious of what how will our friends feel the moment they've entered or come in to our home. I think it is just normal that we tend to become to obsessive in holding up a party and arranging or fixing our home that depends wholly in the occasion. We're just trying to make them comfortable and be relaxed the moment they visit our home.